Kwale can create the first well planned city in Kenya thanks to the planned Southern Bypass. – Mohammed Hersi . A hotelier who is passionate about Tourism & Governance in Africa. It is my pleasure to welcome you to my blog. Kwale can create the first well planned city in Kenya thanks to the planned Southern Bypass. Why Kwale is the next big thing if only they seize the opportunity. 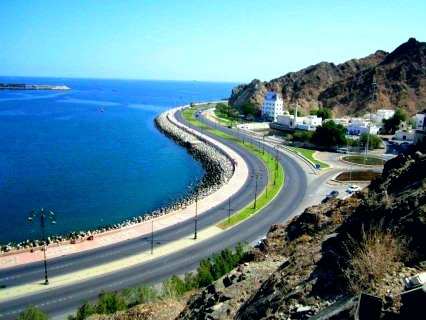 Above is Muscat Corniche drive that can be replicated at the Tsunza waterfront. We must avoid private homes taking up this space . For those who are observant you would have seen the invitation by GOK for bidders to implement the 2nd and 3rd phase of the Southern bypass commonly referred to as the Dongo Kundu a Ksh 30B project supported by JICA. 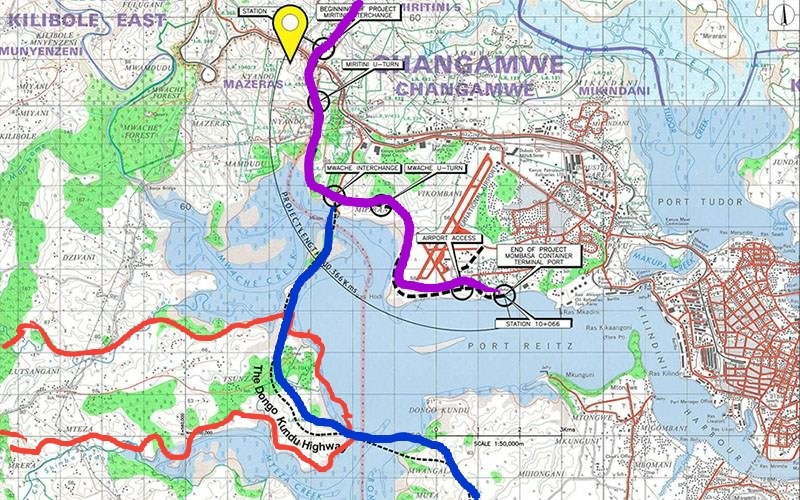 The 2nd phase starts with the Mwache bridge 660 meters which will virtually be right opposite the Miritini SGR station cutting through the village of Tsunza which is a peninsula. I have marked that area in red . This area is the main reason behind this post. The planned bypass will cut right through the Peninsula to exit at the second bridge whivh will be the longest in Africa at 1.4KM with dual highway with an extra lane for service vehicles and emergency lane. The Tsunza Pennisula is facing the port of Mombasa and the Mombasa International Airport including the SGR station. The view is simply stunning. This Pennisula is close to Mombasa 7KM to Miritini interchange once the bypass is done but it falls under Kwale county . The size of Tsunza is more than double the size of Mombasa island hence I see nothing but win win opportunities. Now allow me to address the opportunities that I see . Kwale county has the luxury of setting up the first commercial hub in any county in Kenya by converting this Pennisula to a well planned city in Kenya Coast. They are getting a super very modern highway that will also cut through the planned Mombasa economic zone. Kwale town can still remain the political base while Tsunza Penisula as a new city becomes the commercial hub of Kwale. Many firms name it shipping, banking , including airport hotels and business hotels will find this place an ideal to set up shop. That will only happen if strict zoning and planning is done now. Industries and go down will be located further inland. One thing that ought to be done is to ensure no buildings are allowed to come up on the 1st & 2nd or even 3rd row . We should NOT allow private homes coming up blocking the excellent views. Historically we made that mistake in the rest of our coastline save for Mama Ngina drive. To Kwale county please please zone the place and do not allow industries and container yards from lining up a Ksh 32B highway. Please do not allow speculators who will come to divide land into tiny plots creating another slum . We already have enough slums in Kenya. We need to see service industry occupying the first rows creating huge employment to many not to mention the huge tax base for Kwale county and by extension Kenya. I have chosen to showcase Muscat Corniche in Oman . I believe the ones who set up Mama Ngina had this in mind. Well your journey to any Diani resort will take hardly 30 minutes leaving MIA or SGR Miritini station. You would have noticed the road inside Moi International Airport that connects you to the bypass. One more thing at the end of the 2nd bridge a high tower will be put up as tourist attraction to enable you to get a birds eye view of Mombasa island and the Peninsula. Well as always I choose to see the brighter side of life hence I choose to remain an optimist. Previous PostTo Gov Joho & CS Macharia. Kibarani traffic gridlock now needs your personal attention. Next PostRonaldo, get to know him. It’s sheer hard work. very timely advice. I really hope someone is listening. Good work you are doing keep it up. Hersi you are one of the few people who love this country with all your heart, one day it will sum up to success InshaAllah. To have two twin cities of Mombasa and Tsuza will create a lot of opportunities! Japan and Singapore have managed to economically prosper by optimal exploitation of such land resources. Where do our economic planners/ leaders benchmark when they travel abroad?! Thanks for your great vision @Mohammed Hersi! Pity wont help Dullah. Lets educate our people. As a coasterian am afraid of land grabbers too…. I love the ideas. I sure hope Bwana mvurya read this.